Medium sized, dome-shaped evergreen. 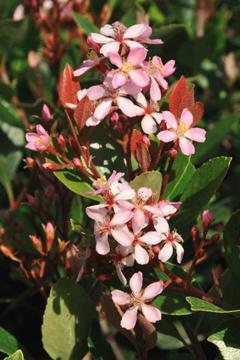 Glossy, leathery, dark green leaves, bronze tinged when young. Rose-pink flowers in late spring, later followed by bluish-black berries. There is some confusion because separately listed varieties are sold as Rhaphiolepis indica 'Springtime' and Rhaphiolepis x delacourii 'Spring Time' or 'Springtime'. We are not sure if these are actually refering to the same cultivar?